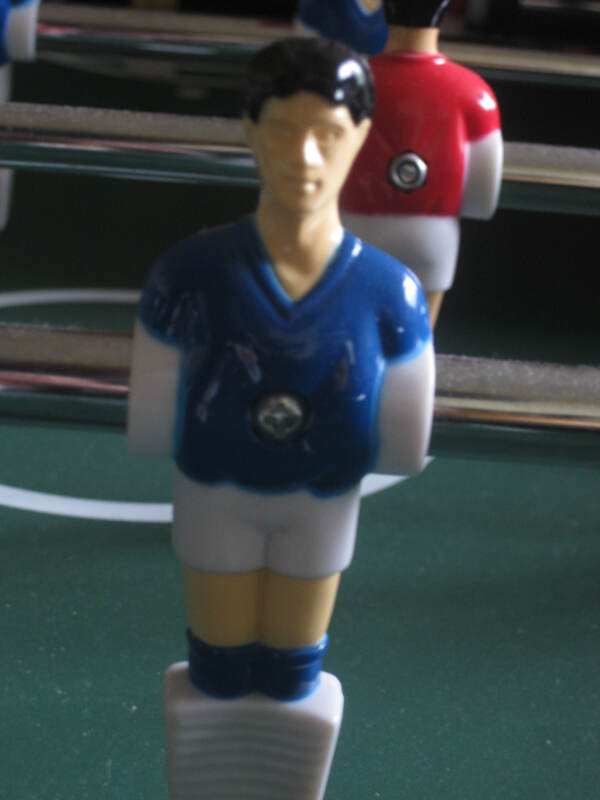 Apologies for the late update for all those waiting to find out how the Yooro 2012 table football championship group stages ended, but it’s been a bit manic in Daftown, not helped when someone pulled a wire out of our wireless at a key moment. What’s more, we suffered a few problems that made that delay in Donetsk for the deluge at the start of the Ukraine v France match ‘pail’ in significance (sorry, hopefully that’s the last bad pun … maybe). First, we had a player injury in the Denmark v Germany clash that necessitated an overnight postponement, the teams resuming at 6-6 the following afternoon and Orson Morten’s Danes reacting better – their 10-8 victory ensuring both sides progressed to the last eight. But there were four more key matches to come before we knew the full quarter-final line-up. And even then we weren’t too sure. It all started going wrong when my youngest came close to swallowing a cough sweet at a crucial moment, the lozenge in question ending up on the floor. The resultant breach of the ‘five-second rule’ meant she had to go and wash it under the tap before we started again. But in her haste to return, her bare foot caught a door on the way back and there were tears … followed pretty swiftly by bedtime. That set us back (yes, she’s fine now, so put down the phone, you don’t need to call ChildLine), but even more drama was to follow two nights later, while trying to work out the final quarter-finalist. I blame UEFA, whose policy of ‘results between nations tied on points’ rather than goal difference left our tournament ‘suits’ at YooArthur adopting a similar policy … then failing to work out what the hell that meant. It was easy enough with the other groups, but in Group D –England’s group – I have to break it to you that French France won all three matches and the other three teams won one each. If it was down to old-fashioned goal difference followed by goals scored, Sweden would have bagged second place (26 goals scored, 28 conceded), with England just missing out (25-27) and Ukraine bottom (19-27). But – on the whim of YooArthur bosses Michel Platypus and Seth Blather – it appears that you only take into consideration the matches involving the teams in question. Johan Cabbage: The French striker effects nonchalance, despite a 100% showing for Laurent Blancmange’s side in controversial Group D.
Still with us? I know time’s precious, but I’m getting there … honest. So that took France’s results out of the loop, which we at first thought was great news for England (17-17), who fared better than Sweden (17-18). But we were forgetting that Ukraine had been stuffed 10-4 by France, a result that no longer counted, leaving them in second place (18-17). As expected, Coy Hudson was disappointed but gracious at the result, and Ingerland’s dream was over. Some muttered that it was divine providence after that ball-over-the-line fiasco in Donetsk, while others countered that with the old ‘offside’ argument. This was of course totally irrelevant. No one has ever been offside on the New Table of Dreams, or in fact on the legendary table that we had before that. It was a blow to see the back of a talented side just hitting their top form, but we learned some valuable lessons along the way. In short, our girls were fractious to say the least after a late night on Tuesday watching the action from the Donbas Arena. So when the ‘lucky’ coin-call led to them being paired together as England against myself and the other half’s Ukraine the following evening in a delayed decider, there were definite signs of lethargy in their subsequent 10-7 defeat. And believe me, we tried our best to ship goals. On a brighter side, I can report that there were sweeping choruses of ‘Molly Malone’ from the Oirish contingent as Tony Van Trapp’s side sprang a stunning 10-9 victory over the Eyetalians to secure their own quarter-final place, and they now face Ukraine. Also in Group C, there was a stunning 10-2 win for Spain– the best of the tournament – as Ferdie Toreador hit a hatful of goals to see his side into a showdown with Laurent Blancmange’s unbeaten French France. And those quarter-finals start tonight with what should be a colossal encounter between Russia and Joachim Lowenbrau’s Germany, followed on Friday night by Orson Morsen’s Denmark againstPoland. So there you have it, Coy and co. may have departed earlier than we hoped for, there will no more Ron Aldi and Nani Lidl moments of Portuguese magic, no Greek grace or Czech charm, no Double Dutch mastery or Croatian artistry, no Italian renaissance or Swedish swagger from here on in. But there’s still plenty to savour as the Yooro 20012 table football tournament rocks on to its final seven matches. Final group results: Group A – Poland 10 Greece 6; Russia 7 Czech Republic 10; Greece 10 Czech Republic 4; Poland 5 Russia 10; Czech Republic 6 Poland 10; Greece 6 Russia 10. Group B – Holland 10 Denmark 8; Germany 10 Portugal 5; Denmark 10 Portugal 4; Netherlands 4 Germany 10; Portugal 10 Netherlands 6; Denmark 10 Germany 8. Group C – Spain 10 Italy 4; Ireland 9 Croatia 10; Italy 10 Croatia 6; Spain 7 Ireland 10; Croatia 2 Spain 10; Italy 9 Ireland 10. Group D – France 10 England 8;Ukraine 8 Sweden 10; Ukraine 4 France 10; Sweden 7 England 10; England 7 Ukraine 10; Sweden 9 France 10. 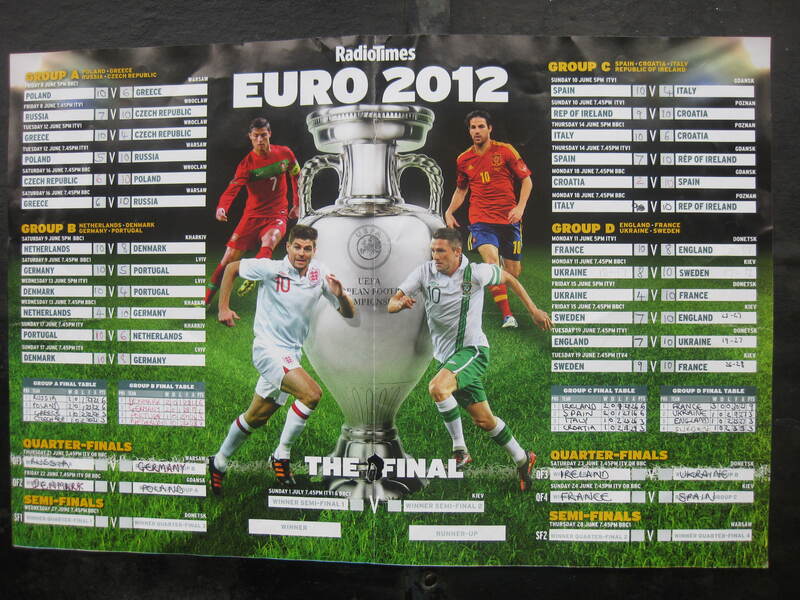 This entry was posted in sport and tagged Euro 2012, European Championships, Football, sport, table football. Bookmark the permalink.